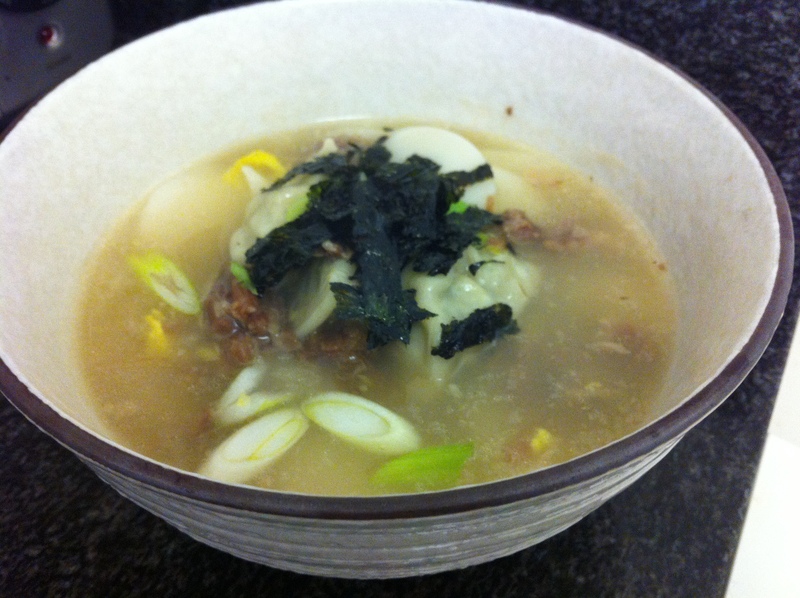 Ttuckmandu-guk is traditionally the first meal Koreans eat on New Year’s Day. The white color of the rice cakes symbolizes a new start and longevity while the round shape represents coins for good luck and wealth. Besides on New Year’s, I often make this one pot dish for a quick lunch simply by adding rice cakes and dumplings into a pot of oxtail soup, which I usually have on hand in the freezer. Oxtail soup is by far my first choice for this dish’s soup base but in college, I used to use store bought chicken stock instead to simplify it even further. You can also use myulchi broth for a lighter alternative. 8 cups of oxtail soup, bones taken out. You can replace this with chicken stock, sagol–guk or myulchi broth. Separate the meat from the bones from the oxtail soup and throw out the bones. Add the meat to the soup and bring it to a boil. If the rice cakes are frozen, defrost them by letting it sit in room temperature or in cold water for about 30 minutes. Add the rice cakes in the boiling oxtail soup. Add the frozen dumplings without defrosting. The dumplings are done when they start floating. Slowly pour in the beaten egg and gently stir. Add about a table spoon of salt if you would like or let individuals add salt and pepper to their liking after served, which I usually do. Serve in a large bowl and garnish with about a tablespoon of crushed gim per bowl. This entry was posted in Good for breakfast, Good for dinner, Good for lunch, Main Dish, Meat/Chicken, Soup/Stew (국/탕/찌게) and tagged dumplings, Mandoo, Oxtail, Rice Cakes, Ttuck by gangnamkitchen. Bookmark the permalink.